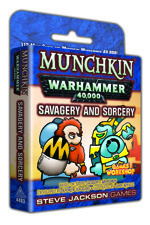 Daily Illuminator: Munchkin Warhammer 40,000 Gets Another Expansion! October 15, 2018: Munchkin Warhammer 40,000 Gets Another Expansion! The nice thing about licensing a game with as much content and history as Warhammer 40,000 is that there is a whole lot of very cool stuff we want to include in our game. In fact, there's so much cool stuff that we had to make a second expansion to fit more of it in! In July, we'll release Munchkin Warhammer 40,000: Savagery and Sorcery, a 112-card expansion featuring one of the most iconic pairs of antagonists in the entire Warhammer 40,000 universe: Space Wolves and Thousand Sons. The Space Wolves are an elite Imperial army, using genetic engineering and intense training to build a proud, deadly force. The Thousand Sons are the pride of Tzeentch, using sorcery to impose Chaos on the entire galaxy. Their battles are the stuff of legends and their heroes are revered millennia later. And now, thanks to development work by Andrew Hackard and illustrations by John Kovalic, you'll be able to add these Armies, plus plenty of monsters and Treasures and Curses they inspired, to your Munchkin Warhammer 40,000 game! You do not need Faith and Firepower to enjoy Savagery and Sorcery, but they work fine together if you add them both. And, really, can you ever have too much Munchkin Warhammer 40,000?